The co-author of this book is a teddy bear. Frank Lloyd Bear, who is both wise and opinionated, believes that teddy bears are not just for kids. Adults can learn a lot from teddy bears. You can learn what it feels like to love and be loved unconditionally. You can learn to practice mindfulness. You can learn how to face life’s challenges and overcome adversity by living in the present moment. Frank Lloyd Bear may not be able to type, because his paws are too chubby, but he’s no dummy. He is dedicated to making the world a better place, and he believes this stuff is important. Frankie’s approach to life is simple: With gentle humor, he strips away what’s unnecessary and looks for the truth. He doesn’t need complexity. He doesn’t even know what complexity is, and he’s happier for it. How does someone who’s only ten inches tall and stuffed get a book published? Frank Lloyd Bear had a little help. 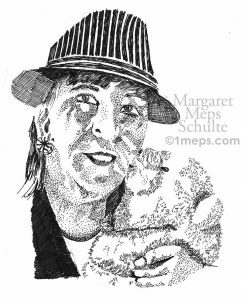 His partner-in-crime, Margaret Meps Schulte, is the award-winning author of Strangers Have the Best Candy. The two of them have been together for over twenty years. In addition to living on land, in houses and apartments, they’ve lived on sailboats. They’ve traveled together for months at a time, driving on the back roads of the U.S. and sleeping in a tent. They’ve talked to many strangers. Meps is a firm believer in the teddy bear philosophy she’s learned from the expert, Frank Lloyd Bear. She was halfway through writing Strangers Have the Best Candy when she hit something much worse than garden-variety writer’s block. She fell into a deep, unshakable depression. At the time, living aboard a 33-foot sailboat, doing a refit in a remote area, Meps didn’t have access to resources like therapists or even antidepressants. She turned to the one thing that had helped in the past: Her kind, loving, understanding teddy bear. Eventually, after a few days, she brought her laptop into the tiny forward cabin, the little fiberglass cave that the two of them had claimed as their hideout. As she regained her equilibrium, she started writing again. She began working, not on the book she had set aside, but on the one you hold in your hands. After Frank Lloyd Bear helped her break through depression and writer’s block, Meps wanted to share his quirky wisdom with the world. If you’ve ever had a bad day, this book is for you. If you’ve ever argued with a loved one or struggled with depression, anxiety, or writer’s block, it’s for you. If you’ve ever grieved, this book is for you. The Joyful Bear is a book for people who seek peace and happiness and contentment. It’s for people looking for more joy in their lives. Frankie and Meps wrote it together, especially for you.